The goal of the furniture showroom is to showcase and market furniture unique to Scandinavian design. When analyzing the characteristics of Scandinavian furniture, the prominent element is the continuous band of material forming the arms, legs, and body. The design of the furniture showroom takes this approach to an architectural scale. The walls, floors, and ceilings act like a continuous ribbon, and through the bends creates interior space. 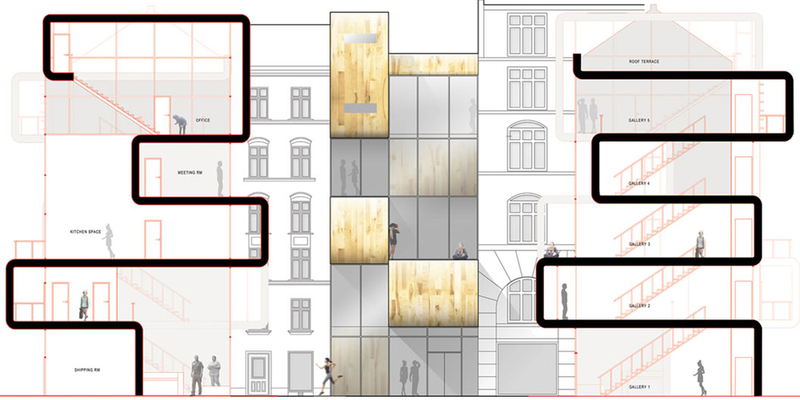 Along the exterior facade, the spaces are not limited to it’s footprint and extend outwards; creating a street-level perspective of its features. Two ribbons make up the building and organize the program. One ribbon for public showcasing and the other for private programs. Together with program, function, and form the building is representative of Scandinavian furniture.